The Issaquah Bank circa 1910. The front sidewalk has just been poured. 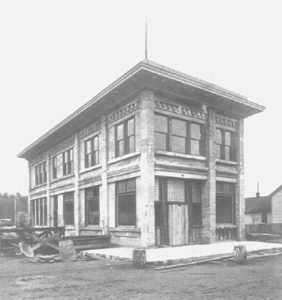 This was a particularly ornate bank building when it was built in 1910 to replace an early wood-frame of the Bank of Issaquah. At that time, the upper floor served as office space for area dentists and doctors. Over time, sections of the building were used to house the Issaquah Post Office, and the telephone exchange. 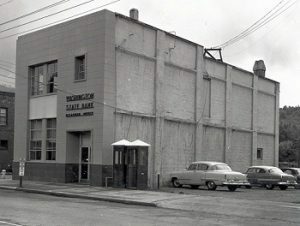 The bank became the “Issaquah State Bank” in 1913 and in 1932 became the Issaquah Office of the “Washington State Bank.” In 1949, the bank was dramatically remodeled, stripping it of its ornate architecture both inside and outside. In one 1953 Issaquah History Museum photo from that time period, it is apparent that the north side of the building was left unfinished. The unfinished side indicates that someone planned to construct an adjacent building. More than fifty years later, the side is still exposed and still unfinished. In 1956, Washington State Bank was purchased by Seattle First National Bank, and in 1965 the local bank branch was moved to the new building further north on Front Street. The Bank of Issaquah building was the most sophisticated building in Issaquah, but it underwent a radical renovation in the late 1940’s that stripped the building of its classical ornate detailing inside and out. The result is a streamlined Art Moderne expression, little changed today. The building is a tall long boxy form 27′ wide along Front Street and 72′ deep along Alder. Unlike its neighbor at 99 Front Street which was built for displaying and selling goods, this building is proportioned for grandeur, status and security. Built as a bank, its vertical window proportions, though very changed from its original classic form, still hint to its roots. The window bays are vertically oriented and deeply recessed; these details enhance the stature of this relatively small building. The windows have been replaced with four panels, each with four horizontal lites; a flat horizontal spandrel divides the windows. The cladding of the building was altered to a large green glazed ceramic tile consistently smooth and sleek; the plasticity of the original ornate structure is absent. The renovation transformed the building into a true Moderne building typified by soft or rounded corners, flat roofs and smooth wall finishes without surface ornamentation. This building originally had vertically oriented windows, and the renovation resulted in the same. This detail is inconsistent with most Moderne buildings built during the 1930’s and 40’s which were characterized by horizontal bands of windows. 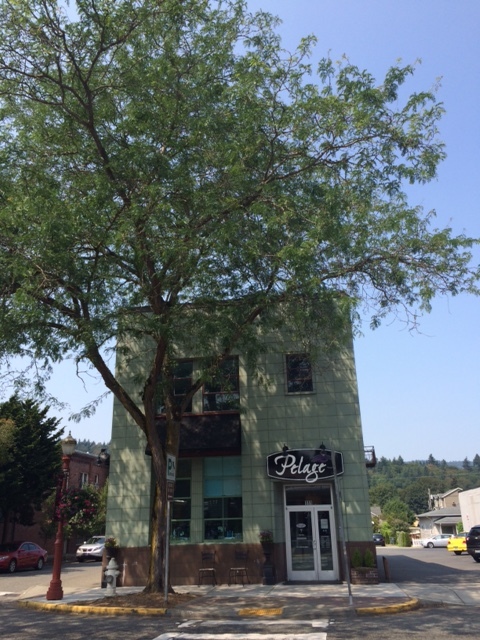 The Bank of Issaquah building now houses the Pelage spa. Photo by Cole Good, 2015.